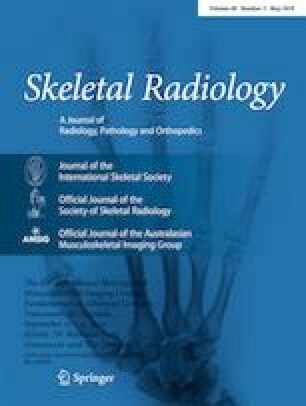 To describe the methodology of constructing a three-dimensional (3D) printed model of the glenohumeral joint, to serve as an interventional phantom for fluoroscopy-guided shoulder arthrography training. The osseous structures, intra-articular space and skin surface of the shoulder were digitally extracted as separate 3D meshes from a normal CT arthrogram of the shoulder, using commercially available software. The osseous structures were 3D-printed in gypsum, a fluoroscopically radiopaque mineral, using binder jet technology. The joint capsule was 3D printed with rubber-like TangoPlus material, using PolyJet technology. The capsule was secured to the humeral head and glenoid to create a sealed intra-articular space. A polyamide mold of the skin was printed using selective laser sintering. The joint was stabilized inside the mold, and the surrounding soft tissues were cast in silicone of varying densities. Fluoroscopically-guided shoulder arthrography was performed using anterior, posterior, and rotator interval approaches. CT arthrographic imaging of the phantom was also performed. A life-size phantom of the glenohumeral joint was constructed. The radiopaque osseous structures replicated in-vivo osseous corticomedullary differentiation, with dense cortical bone and less dense medullary cancellous bone. The glenoid labrum was successfully integrated into the printed capsule, and visualized on CT arthrography. The phantom was repeatedly used to perform shoulder arthrography using all three conventional approaches, and simulated the in vivo challenges of needle guidance. 3D printing of a complex capsule, such as the glenohumeral joint, is possible with this technique. Such a model can serve as a valuable training tool. The authors would like to thank Maureen Schickel from Materialise for offering her technical expertise.